RESEARCH TRIANGLE PARK, NC--(Marketwired - September 14, 2017) - About 77% of surveyed global medical affairs teams consider dedicated CME providers as their first choice when funding continuing medical education (CME) programs, according to a recent study by industry intelligence provider, Cutting Edge Information. 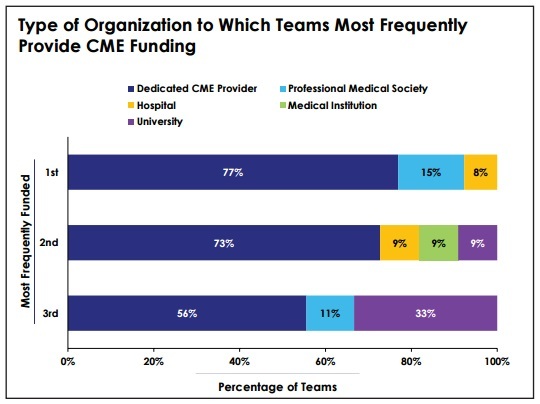 Data published in the study, Medical Education: Innovating CME to Improve Patient Outcomes, revealed that apart from dedicated CME providers, life science teams may dedicate the bulk of their CME funding to hospitals or professional medical societies instead. Equal percentages of surveyed life science teams consider hospitals, medical institutions or universities (9% for each) as their second-most funded CME provider. Roughly 33% of surveyed life science teams will fund a university CME program as their third choice. "Medical education programs are a vital part of any life science team's activities," said Natalie DeMasi, research team leader at Cutting Edge Information. "These activities disseminate new medical information across the medical community to help increase disease awareness and expand knowledge about existing treatment options." Despite the popularity of CME providers, other surveyed medical affairs teams are reluctant to work with dedicated CME providers because of cost concerns. For example, one Top 10 pharmaceutical company's team does not directly work with or fund commercial medical education providers, but it may work indirectly with such groups if they are part of a larger CME initiative. This report examines medical education investments and staffing resources, as well as activities, trends, and event planning approaches. It highlights new, exciting ways that teams are elevating the value of medical education. For more information about Cutting Edge Information's medical affairs and medical education industry research, please visit https://www.cuttingedgeinfo.com/product-category/medical-affairs/.